The flights executed by Winair under the name CN-Express will continue for now, but will soon be evaluated. Seen here is the Air Antilles ATR in St. Maarten on the first day of the service. The Hague – The lifting by the Dutch government of the ban on civil servants with InselAir has -at least in the short term- no consequences for the flight operations of the so-called CN Express. “The agreement for the CN Express has been entered into for a period of three months. We are now half-way. At the beginning it was agreed to hold an interim evaluation after six weeks. This will happen soon”, a spokesman for the Ministry of Infrastructure and Water Management said. Since 26 February, 2018 two flights of Air Antilles have been flying directly between Bonaire and St. Eustatius twice a week. Winair provides the connection to Saba. The Rijksdienst Caribisch Nederland purchases a number of seats on every flight for medical transportation and RCN-employees. In addition, a fixed amount of seats goes into free sales. A single trip, according to the Ministry, costs 300 dollars. 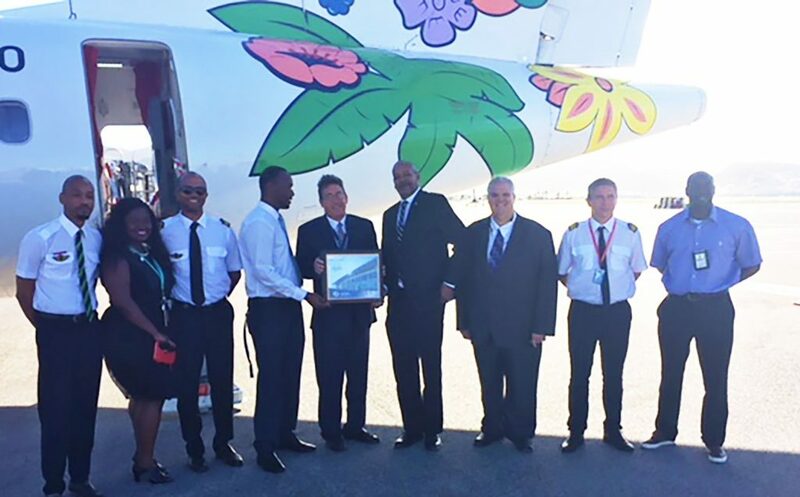 The flights between Bonaire and St. Eustatius had become necessary after a ban was imposed by the Dutch government for travel of any Dutch Government worker (including those employed by RCN) on all Insel Air flights. The demise of Dominican Carrier PAWA-Dominican, which was at least an alternative for travel between Curaçao and St. Maarten, made the situation even more urgent. Critical observers feel that the flights with a 50 seater aircraft between the two islands is not economically feasible.